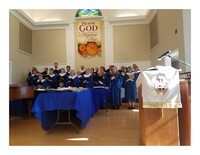 Chancel Choir- Under the spirit-filled leadership of Mark Wilson, this group forms the bedrock of our music program. The Chancel choir sings at most of our 10:30 Sunday morning worship services and rehearses on Thursdays from 7:30 to 9 PM from September through May. The choir is open to anyone who loves to sing and is willing to come to practice. No auditions required! The contribution this choir makes to the service of worship is equaled only by the sense of community they enjoy that arises through their rehearsal time and other activities planned throughout the year.